©2012 R.L. 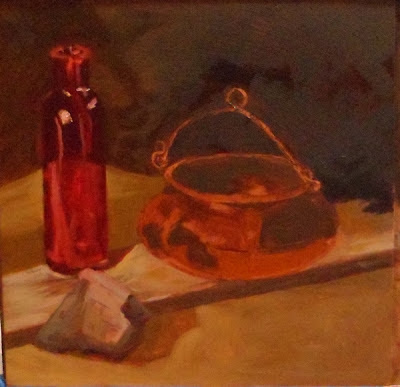 Delight "Glass, Metal, Wood, Stone", 6"x6", oil on copper sheet. Painting in progress. I finally have a chance to try my hand at painting on copper. Here is my painting in progress. Like any new-to-me media or technique, it has its challenges. I have to admit, even with the challenges I am finding it very enjoyable and I am liking the results. At this moment in the painting I have things blocked in and am starting to add refinements. The oil paint takes a bit longer to dry on the copper, specially in the cool stormy weather we have been having lately. The background looks blotchy in this picture because some of it is still wet. I love this little copper pot I picked up at the local thriftstore. It has a really beautiful and fun shape. It will be satisfying to get the detail on the pot and turn and render the form. I am new to painting on copper and have had to stop and let the paint dry a bit to continue on. I have mentioned Susan Renee Lammers' website and blog before but she has a very nice article on painting on copper on her site here. I admire not only her painting, but her dedication and hard work as a professional artist. I find her very inspiring. 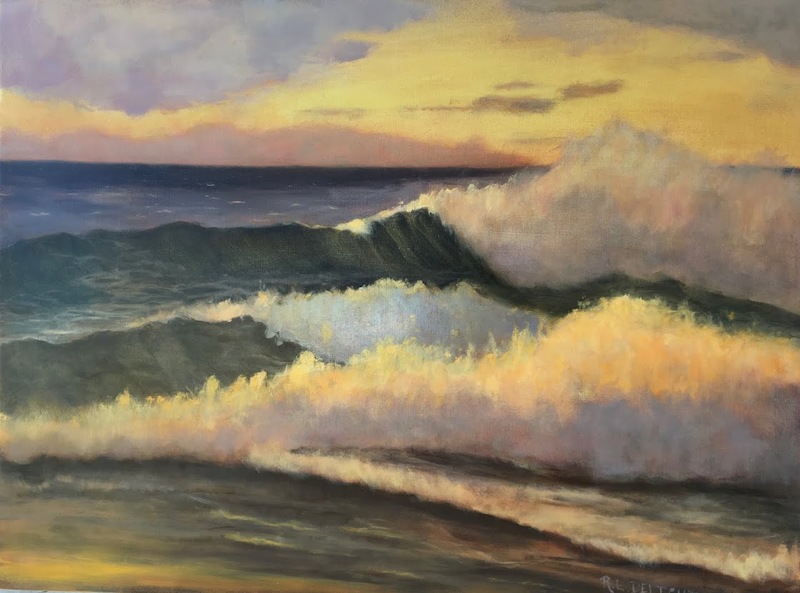 Her blog chronicles her daily painting on the East coast of the U. S. and the sweet and funny antics of her two Golden Retriever rescue dogs, Duke and Daisy. Definitely worth reading and checking out her beautiful work. Due to the longer than expected learning curve on the copper painting, I have delayed my own daily painting by a few days to work on this. I also have to add that I did a few things differently than what Renee Lammers suggests on her website. As a vegan artist, I did not want to use the sable brushes she recommends. She did not have a good experience using synthetic brushes on copper but I found some that work more or less. I used Utrecht's Series 235 Sablette synthetic brushes. They worked well once I got the hang of them. I haven't really tried to use them with an alla prima approach though so will have to experiment some more. I am building the painting as I usually do, layer by layer. I am also looking around to find a source of reclaimed and more ecologically sound copper sheeting. At the foot of Neahkanie Mountain. In addition to daily painting, I am committing to going out to paint en plein air once a week. 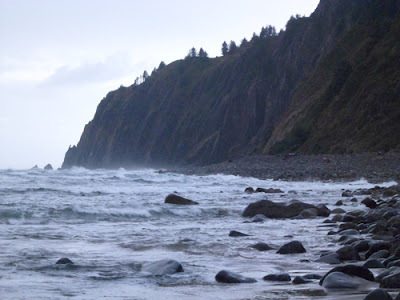 The weather will not always be the best, but this time of year the light, skies, and waves are stunning and dramatic. I did a recce today at the foot of Neahkahnie mountain to not only scout out possible painting views but to test out my foul-weather gear. My gear is old and is not perfect but it will do for now until I can earn enough to buy some better gear. The beach was beautiful and it was raining but not a hint of a breeze. It is the wind and wet that concerns me the most. I plan on going out tomorrow morning an hour or so before the high tide so we shall see how it works. That is it for today! This weekend I will be masquerading as Tweety LaRoux, doing the sound effects for a local play my mate is directing. It is the final weekend of the performance and I will be glad when it is done. Sunday I will be playing with our band for a local fundraiser which is always a joy. Hi Renee! Glad to see you are trying out the copper substrate. Very interesting about the synthetic line of brushes. I only use two brushes of sables. They don't wear out like synthetic brushes do. I can use two for 6 months. Just thought I would let you know. I am selling my palettes now each day for 20$ to keep them out of the land fill. I too use waste copper panels. Thanks for doing copper! Thanks for the comment Renee! I have had pretty good luck with synthetics holding up so far. I don't use (or eat) any animal products in my life, including not wearing wool, silk, or leather. This is my own personal belief and not one I judge or impose on others. I do remember reading that you found waste copper panels at a weathervane factory? I will have to see what you use for a palette. It is pretty great that you can get a little money for them and keep them out of the landfill at the same time. A win-win!